It is possible to reduce your monthly utility bills up to 50% when you make some simple changes. Energy efficiency of your home can be improved if you replace home appliances with energy star models, replace windows, patch up leaks in your duct-work, and add/change insulation in the house. 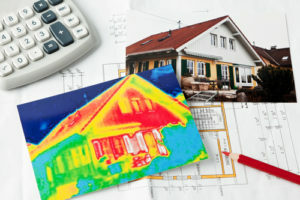 The absolute best way to find out where the major problem areas are in your house is to have a home energy assessment. When you use Thermal Imaging it is the best way to detect infrared light. When we think about it every object emits energy, so the way that an object reflects this energy is based on their temperature. For example : hot objects give off more thermal energy than cold objects. You have the choice to have an interior or exterior inspection. The energy auditor will decide which method is best with considering the weather. Scans done from indoors are more common because when warm air escapes from a building it does not always move through the walls in a straight line. Loss of heat could be detected on the outside of the wall but could originate at another location inside of the wall. Another factor is weather conditions, it can make it very difficult to detect temperature differences on the exterior of a home. Interior surveys are generally more common and most recommended. It is recommended to have a scan done before purchasing a house, because even with newer homes there can be defects. It is also is a great idea if we have suspected an issue inside of our walls, with a thermal imaging scanner you can determine the exact size and location of a problem before you have to cut a single hole. So it will save you time, money, and multiple holes being drilled into your walls. Hiring a highly trained professional is the only way to achieve an accurate reading on scans. They then will be able to give detailed information on the severity of leaks, inadequate insulation and other issues that may arise.